Red Cedars is a truly special place to stay. Tucked away in the tall trees behind the pub this lovely cottage makes the perfect spot to return to after your day of adventures on the Helford Passage. 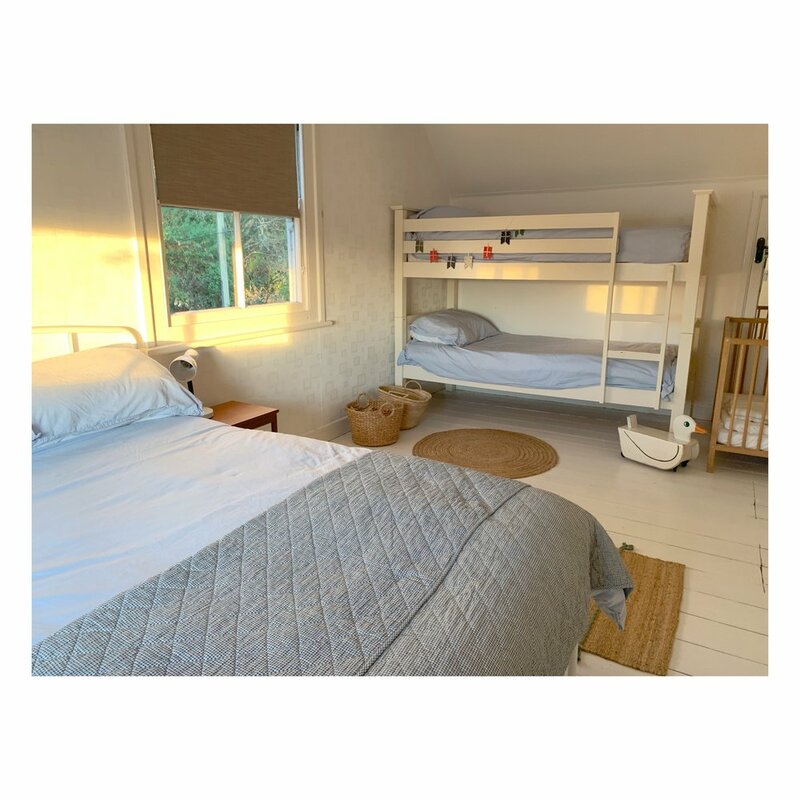 Recently renovated, Red Cedars sleeps up to six with an additional Cot and Crib provided if needed. All of the living spaces have beautiful views out on to the river below and the cottage is situated less than a minutes walk from the iconic Ferry Boat Inn. The cottage has two bedrooms upstairs and one bathroom (located on the ground floor). The Master bedroom has one King size bed and is bright and calming with beautiful views over the water. The second bedroom has single sized Bunk beds, a separate double bed. A cot and crib are available upon request. Downstairs there is a pretty sitting room with with dining area, Smart TV, DVD player, and plenty of books and board games to keep you entertained. The kitchen has a breakfast table, washing machine, dishwasher and large fridge ( a microwave can be provided upon request). The bathroom is simple and clean with a shower bath. We provide all bedlinen and towels for your stay along with plenty of extra blankets to snuggle up after long days on the water. We want you to escape and relax however should you need it Red Cedar also has wi-fi throughout. Red Cedars also offers a large enclosed private garden, green with ferns and palm trees. There is a decked area with outdoor table and chairs perfect for an evening BBQ. There is secure private parking for 2 cars, and plenty of room to store paddle boards and wetsuits..
We love dogs down here so please do bring along your furry friends for a small extra surcharge of £35 per stay. We will even provide a basket and bowl for him! We aim to make your time at Red Cedars as memorable as possible so please do let us know if there is anything we can do to make your stay with us extra special. Upon request we can provide extra special welcome packages, arrange activities and boat hire for you or a special picnic for a day out. Prices for Red Cedars vary during the year. *Prices are based on nights stayed (include arrival day but not departure day). ** 3 night minimum booking for each stay.